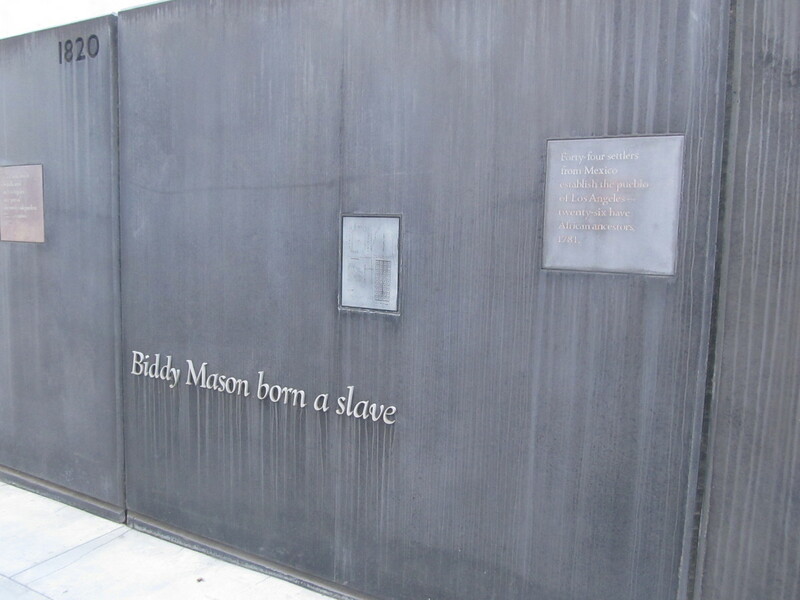 Last week, I saw an article on Atlas Obscura about Biddy Mason. 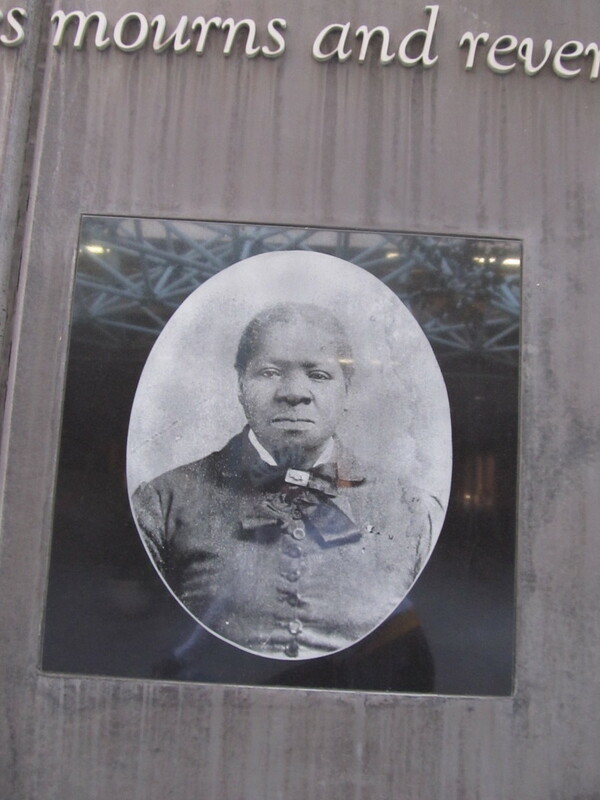 who was born a slave in Mississippi in the early 1800s, and won her freedom after being brought to California. 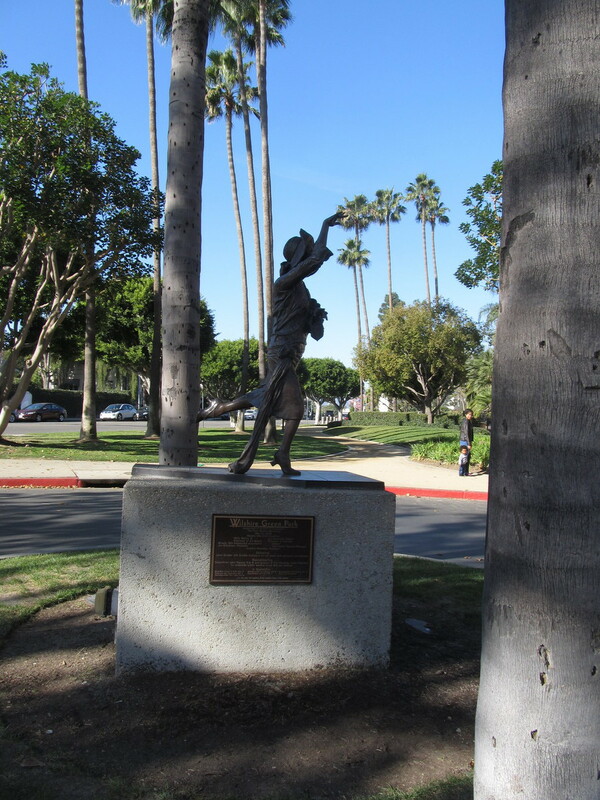 It was really a remarkable story, and it said there is a small park in downtown L.A. that tells her story. From the address, I knew we’d been by there a hundred times, but we’d never noticed it. So that was our destination for today. The ride was basically to downtown L.A., then home via Echo Park and the Arroyo Seco. 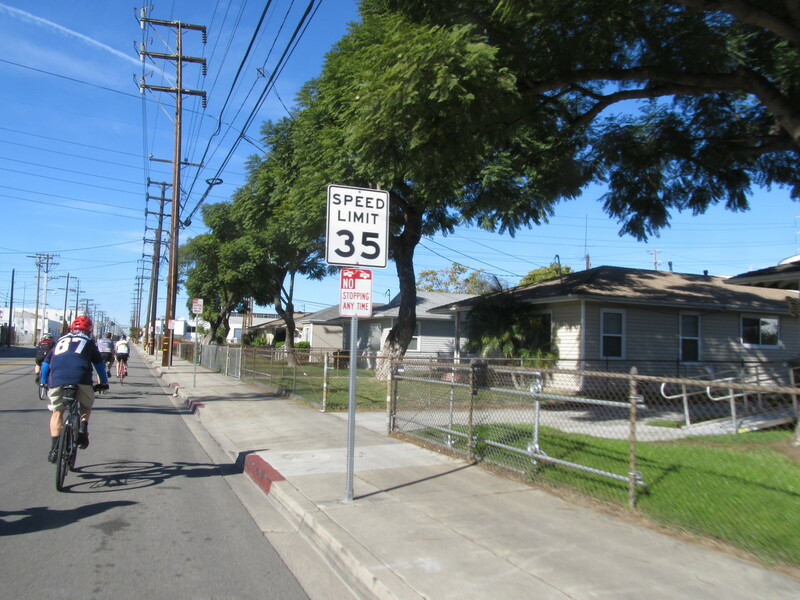 We rode down Huntington Drive, and then Mission Rd. 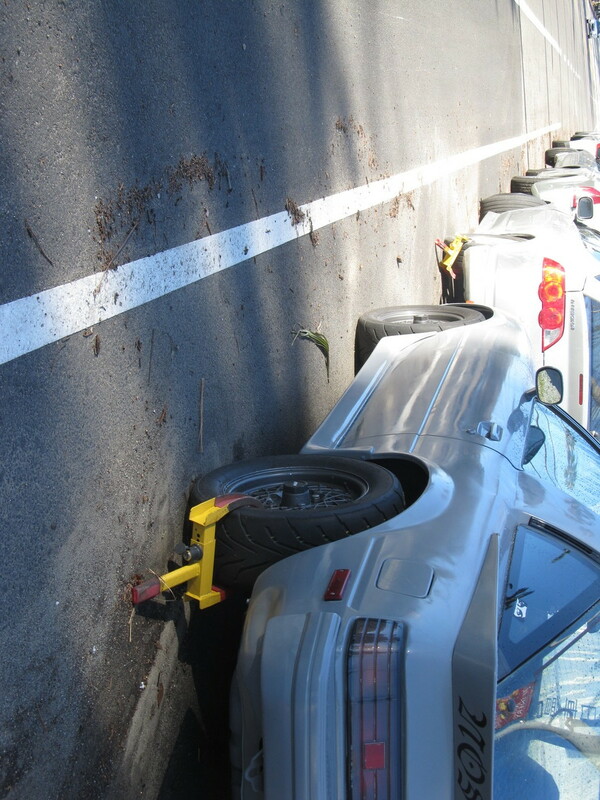 There is one stretch along Mission where there are always several cars with Denver boots on them. 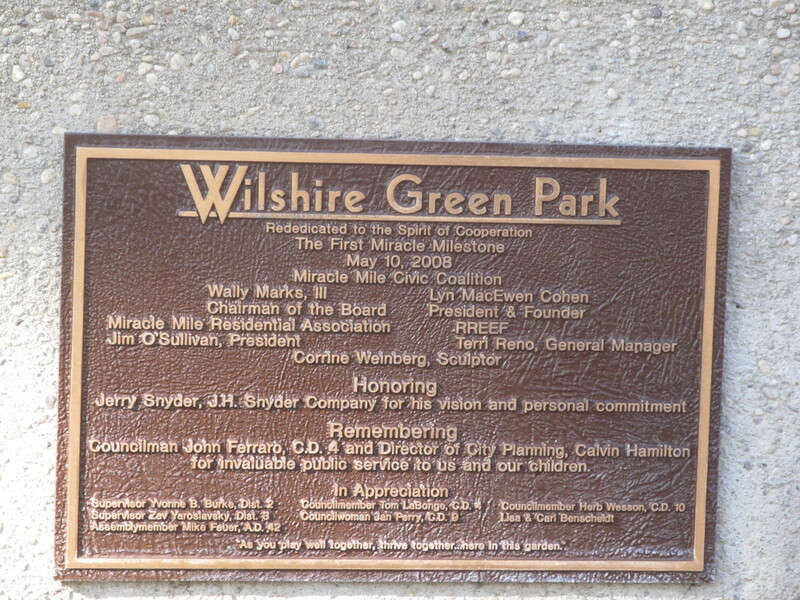 When we got downtown, we went looking for the park. 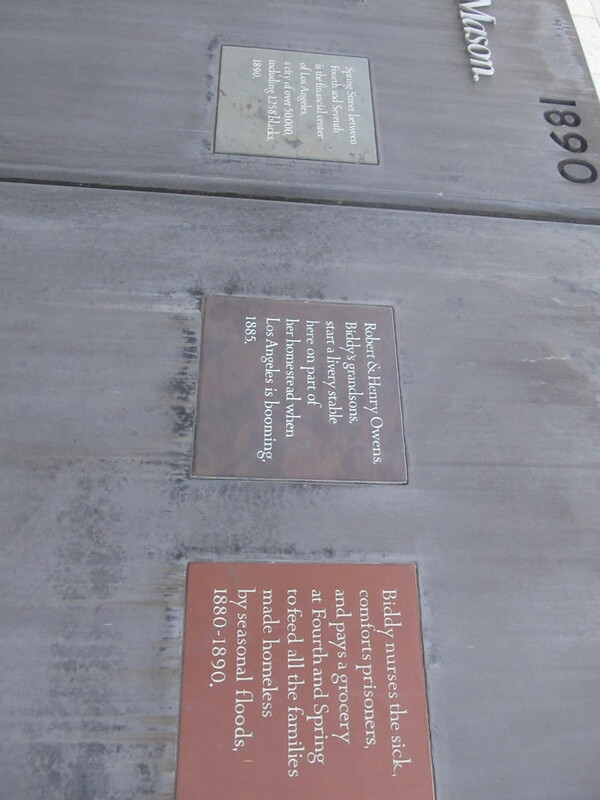 It turned out to be in the alley behind the buildings there, which explains why we’d never noticed it before. 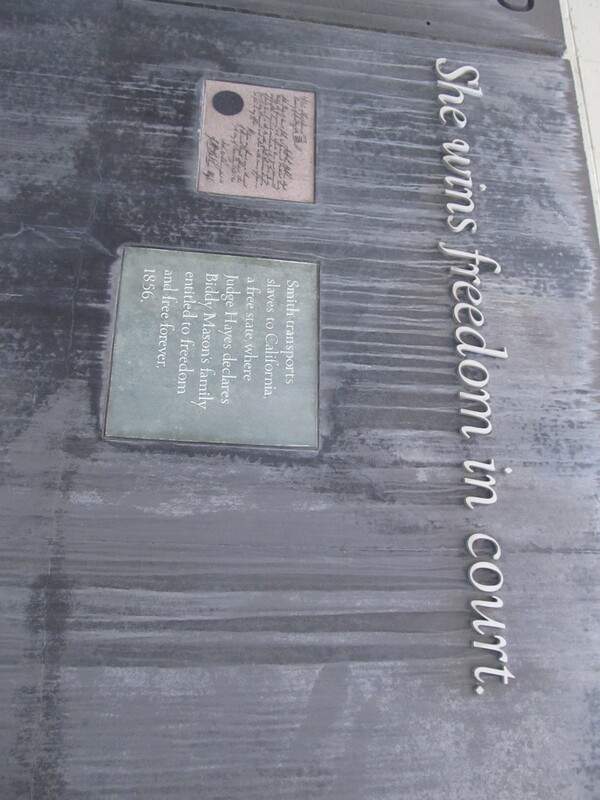 The panels on the wall told her story. She really did have a remarkable life. 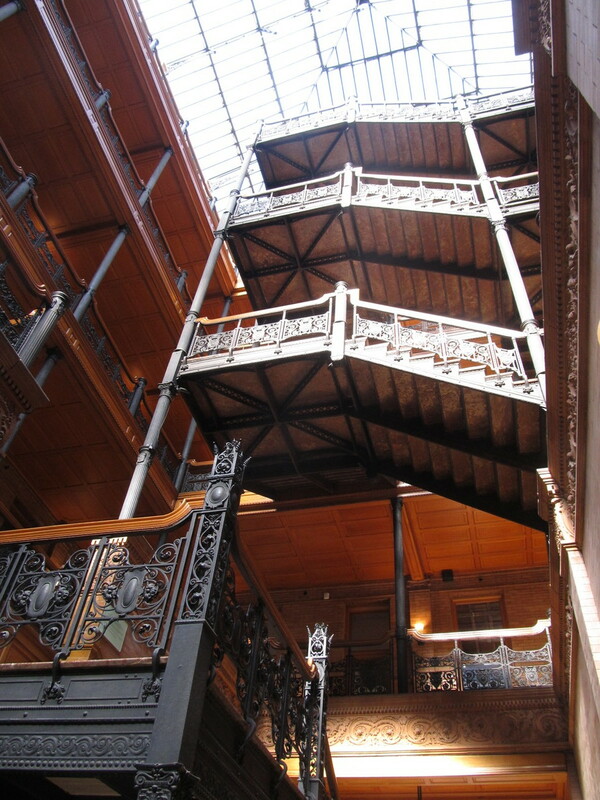 After looking at the park, we noticed that the alley we were in was right behind the Bradbury Building, which is an ornate old building that was J.F. Sebastian’s home in “Blade Runner”, as well as appearing in lots of other movies over the years. We had a look into the lobby there before continuing on our ride. From downtown, we rode out 7th St to Westlake, and then up into Echo Park and our snack stop at Chango Coffee. 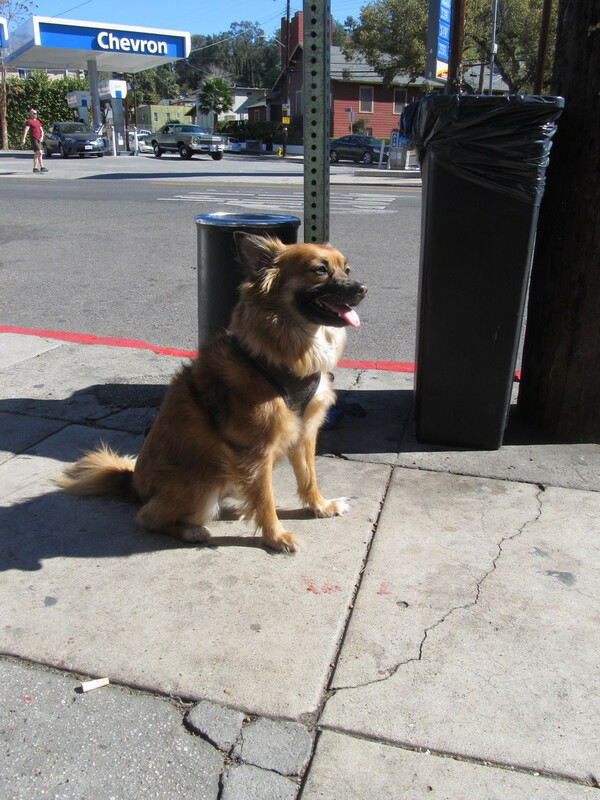 As always, there were lots of Echo Park people with their absurdly-well-behaved dogs. I got a sort of artisanal version of an Egg McMuffin there. On the way home, we took one more short side trip. 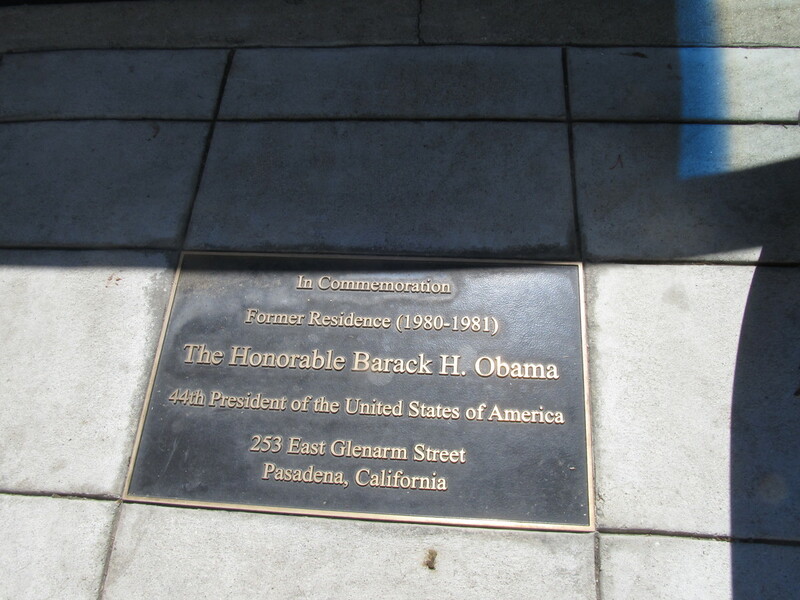 I’d heard recently that the city of Pasadena had put a plaque in front of the apartment building where President Obama lived when he was a student at Occidental College. So we had to go see it. 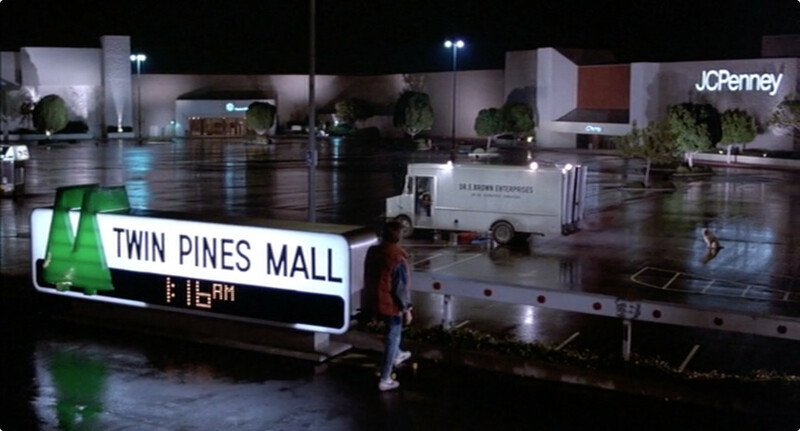 Today’s bike ride was a visit to the Puente Hills Mall, which was the location used in “Back to the Future”, where Doc Brown first shows Marty the DeLorean time machine. It was kind of chilly this morning, but promised to warm up some and be nice later. The route was planned to try and be as direct as possible, while avoiding a few major streets that I knew would be bad for riding. Still, the route was a bit longer than our usual rides. Fortunately, it didn’t have any major hills. 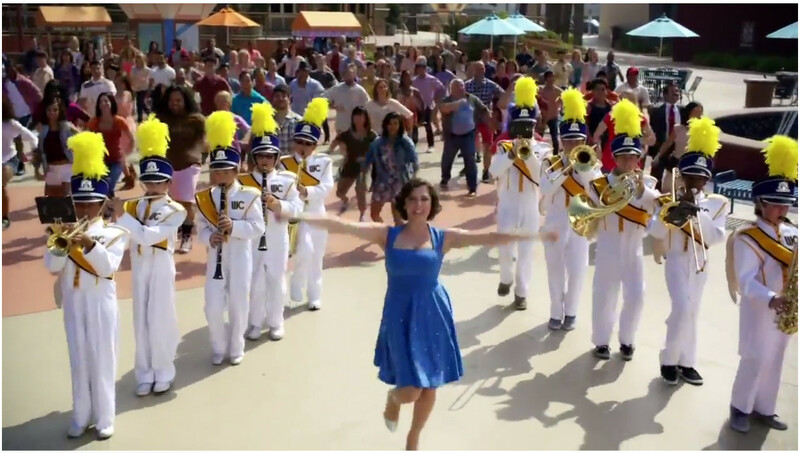 When we got to the mall, I found the spot that matched up with the screenshot from the movie. Then I rode down to the spot in the parking lot where Doc’s truck was parked. 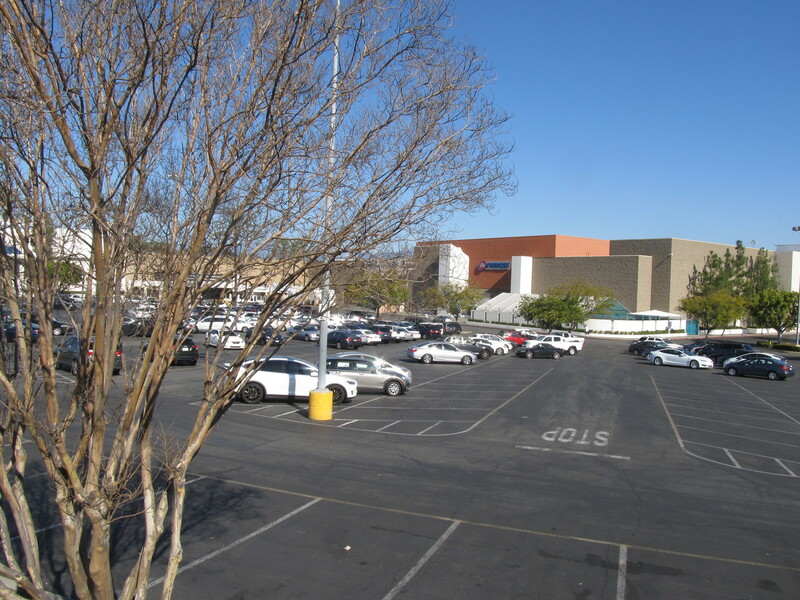 Fortunately, the parking lot was pretty empty, so I took a run across it, just to see if I could get up to 88mph. Sadly, not today. 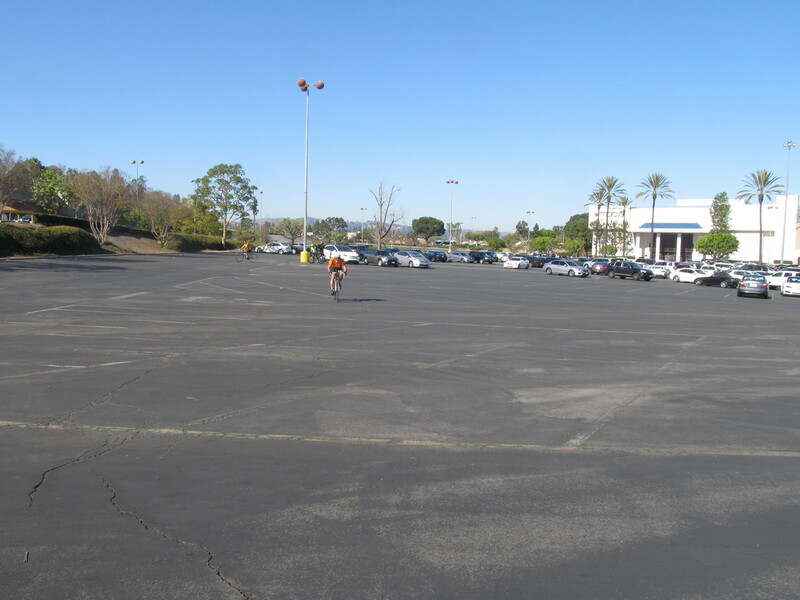 Then we all rode over to the corner of the parking lot, where there was a Panera Bread for drinks and snacks. The route back was slightly different from the route going out. The underpass they are building to run Puente Rd under the railroad tracks still isn’t finished, so we had to take a bit of a detour. I guess I’ll have to figure out a different way to get through there. 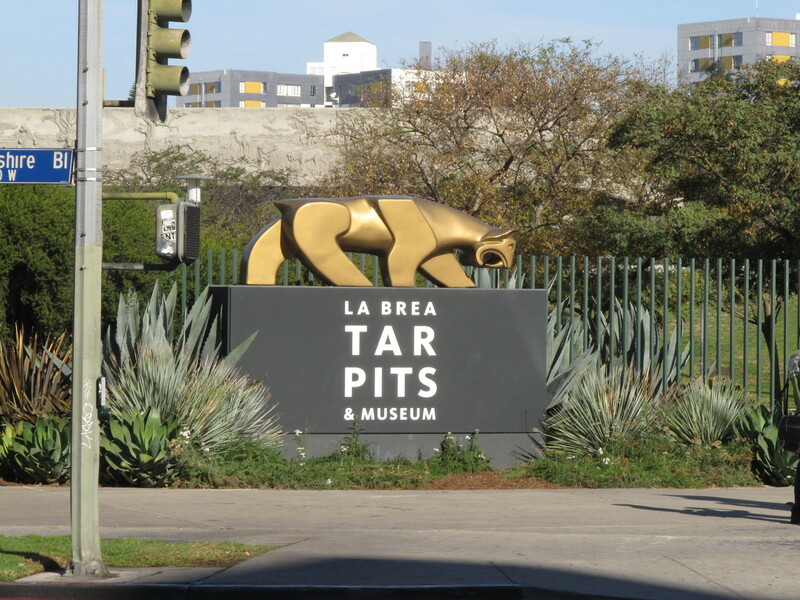 Today’s bike club ride was a trip out to Park La Brea and the little cafe inside. We went there once last summer, and it was a nice setting. 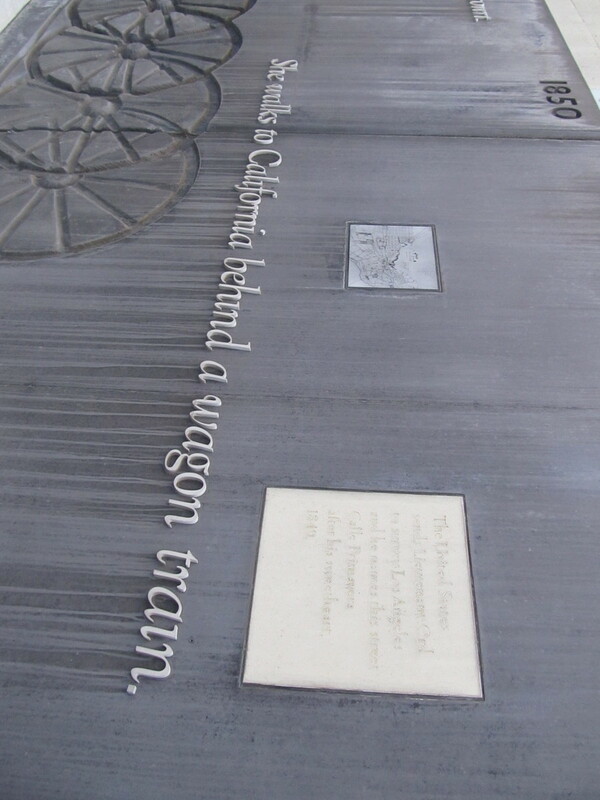 The route went through Highland Park and Silverlake on the way out, and then back home by way of downtown L.A. All ground we’ve covered before. There wasn’t really any sightseeing along this route. But it was a nice day, so it was just pleasant to be out riding. 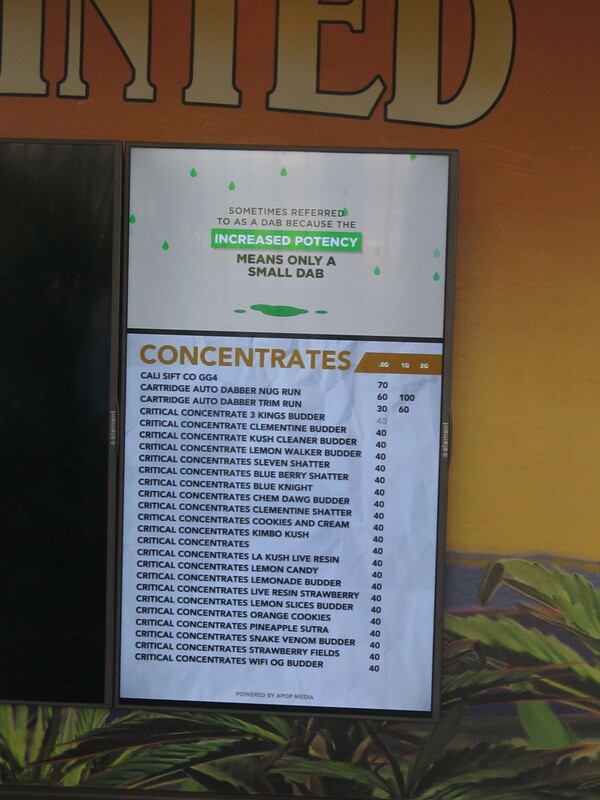 This past week, I saw an item in the L.A. Times about another cannabis store opening up, making it the third one in Los Angeles County. 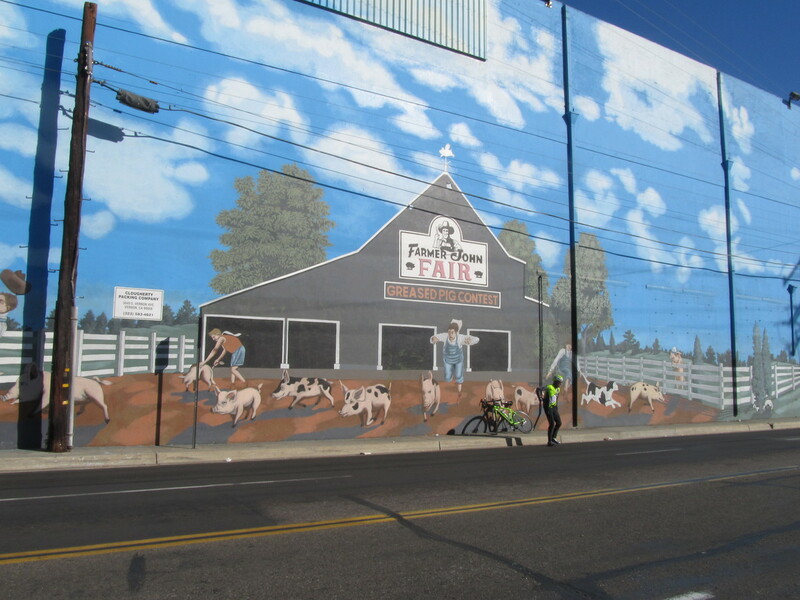 I looked it up, and it turned out to be in Maywood, which is just the other side of Vernon, and about two miles south of the Farmer John hog mural. So that was our destination for today. We got a late start today. John had just put new tires on his bike, and they were very hard to put on. So he had two pinch flats. I ended up putting two new tubes in the tires, and then we were able to get going. 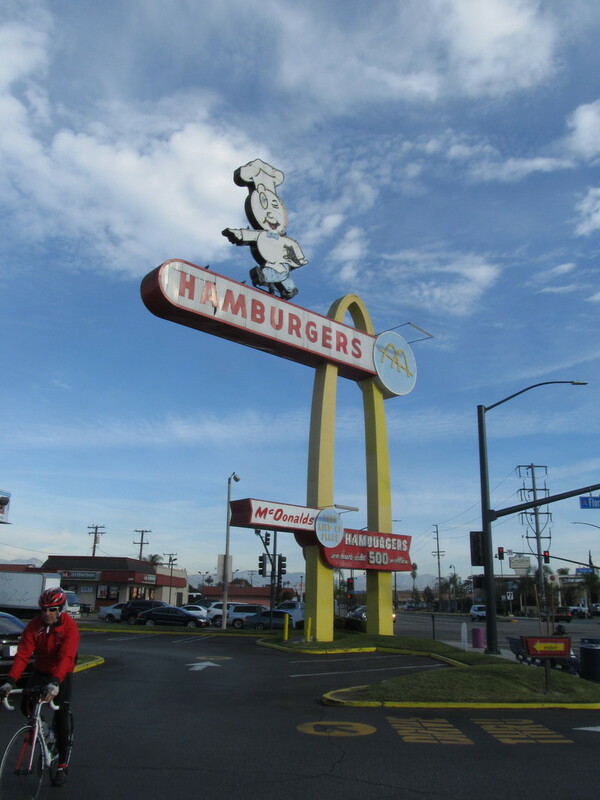 We took our regular route to downtown L.A., down Huntington Drive. 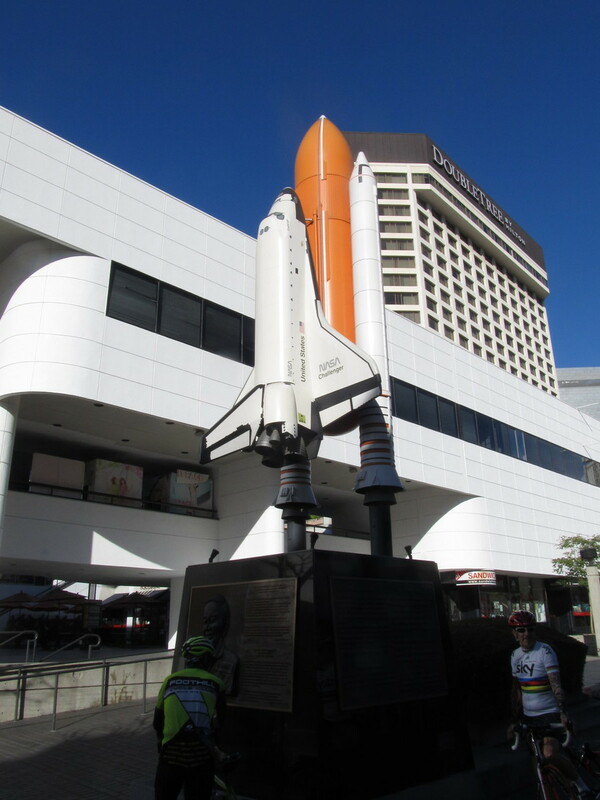 Along the way, I realized that it was the 28th, making today the 32nd anniversary of the Space Shuttle Challenger disaster. 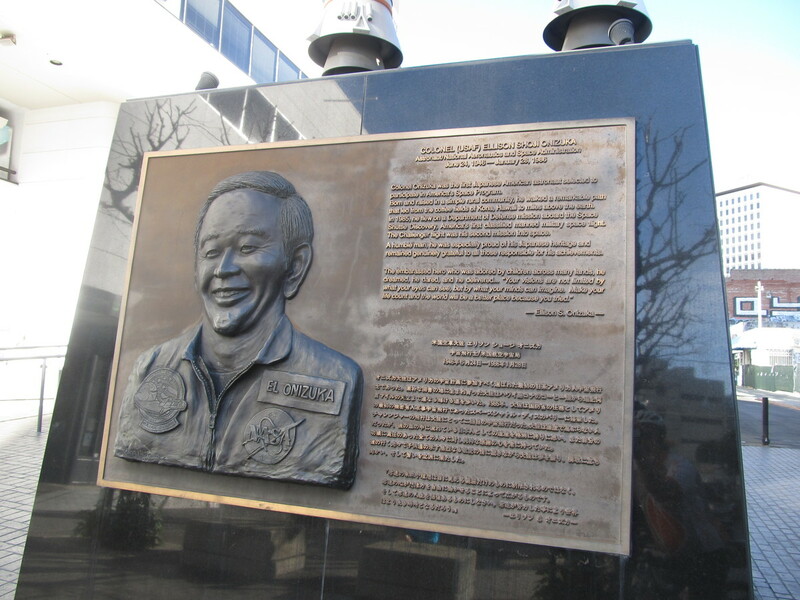 So we made a short detour to go through Little Tokyo to see the monument to Ellison Onizuka there. Leaving Little Tokyo, we took Santa Fe Ave south to get to Vernon. 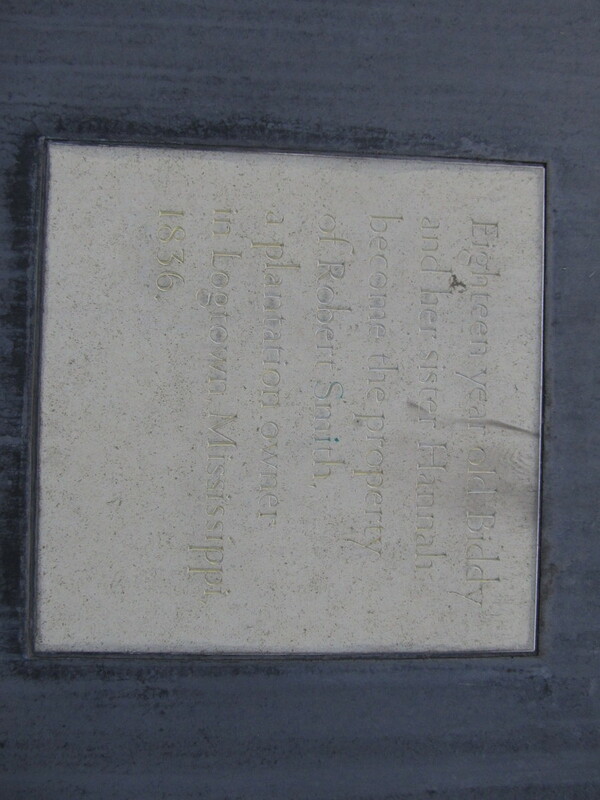 We turned off to pass by the Farmer John plant, and then continued on to get to Maywood. 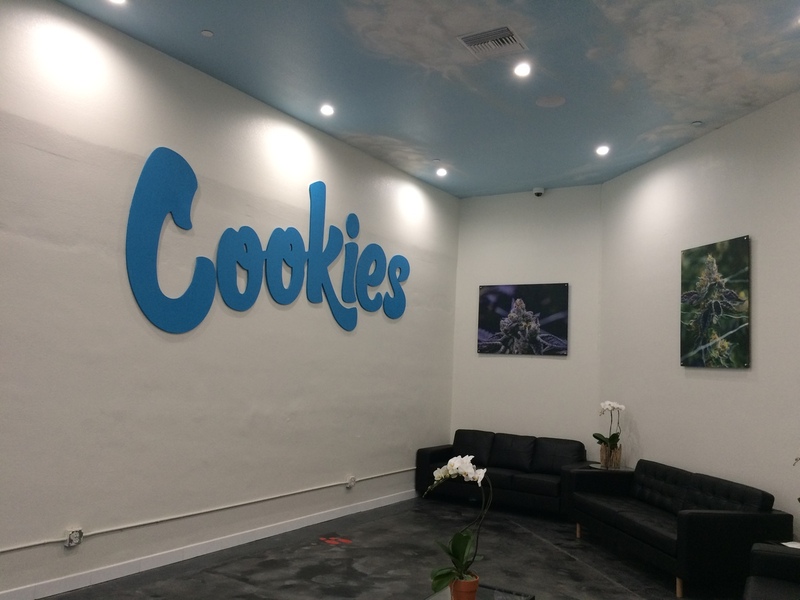 When we got to Cookies L.A., we were surprised at how big it was. 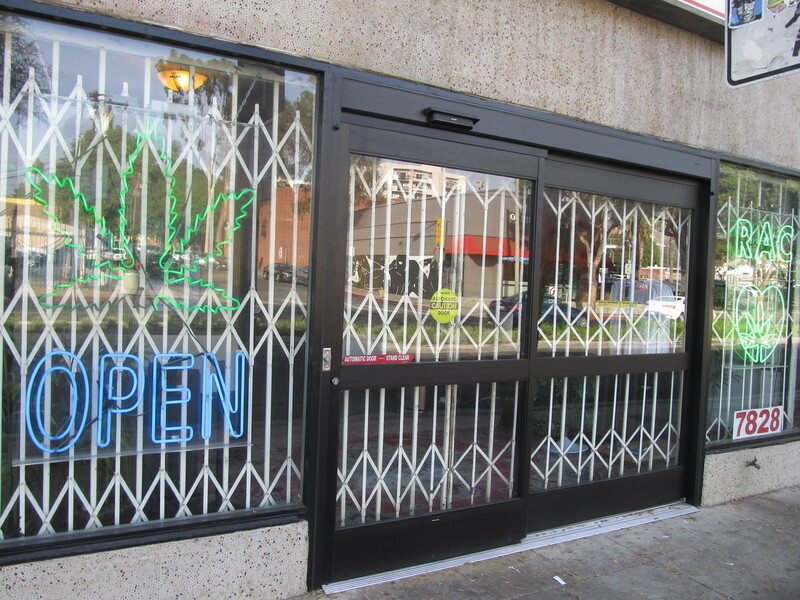 The one we went to see in West Hollywood a few weeks ago was just a little storefront. 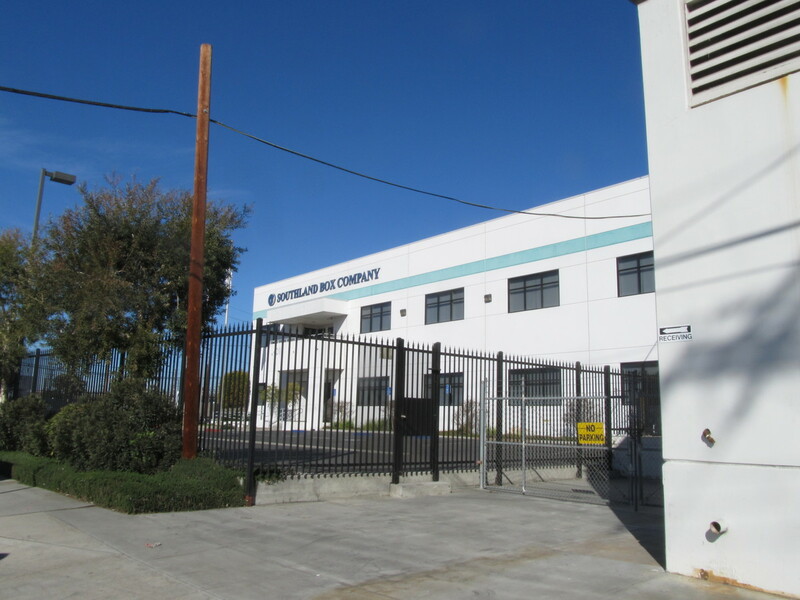 But this one was a big industrial building. 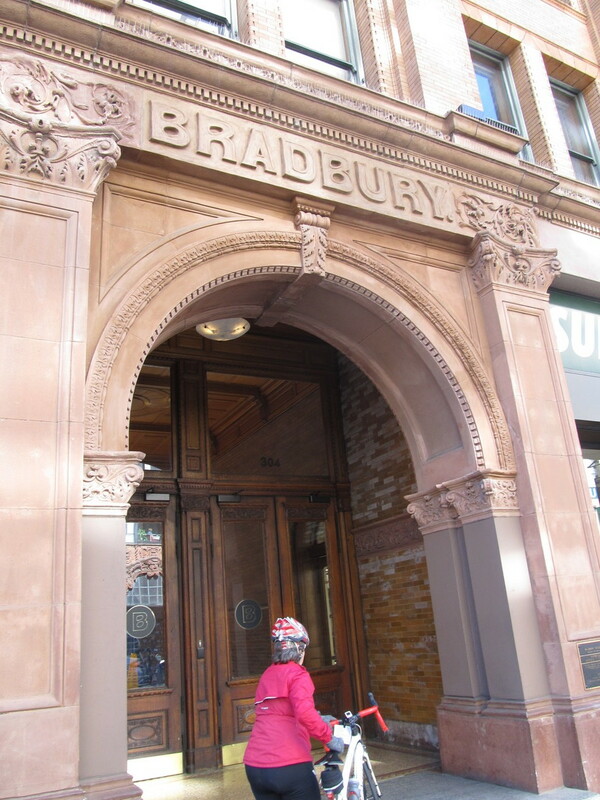 We didn’t think it would be open yet, but there were a couple of security guards by the door. It turned out that John’s flat tires had slowed us down just enough that the store had just opened. So we had to take a look inside. The lobby area looks like a fancy doctor’s office waiting area. 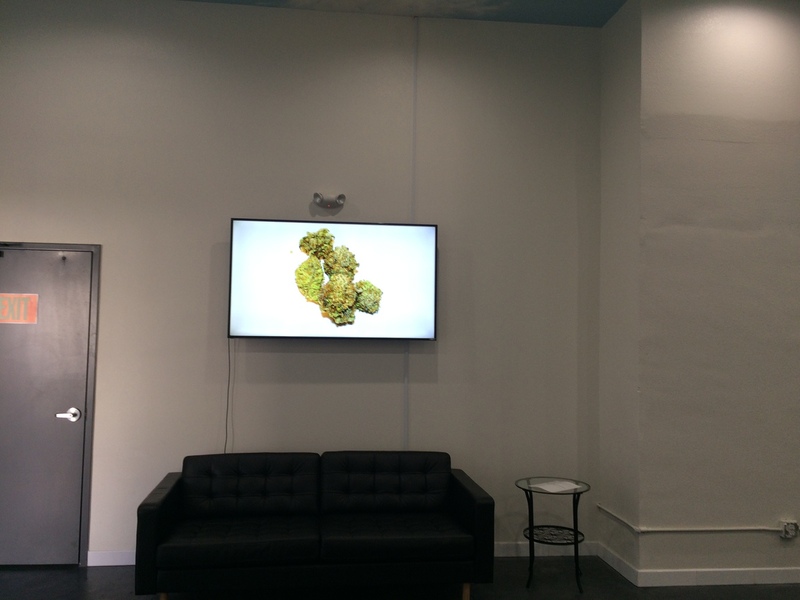 Apparently, since cannabis is still illegal on the Federal level, the shop has to be a cash-only business, so there was a little ATM in the waiting area. And that was also why there were three guards outside. They had a little booth with a guy who checked our IDs. Then he opened the door so we could go into the actual store. There were a pair of doors, almost like an airlock to get inside. The actual store area looked like a big, fancy department store cosmetics counter. 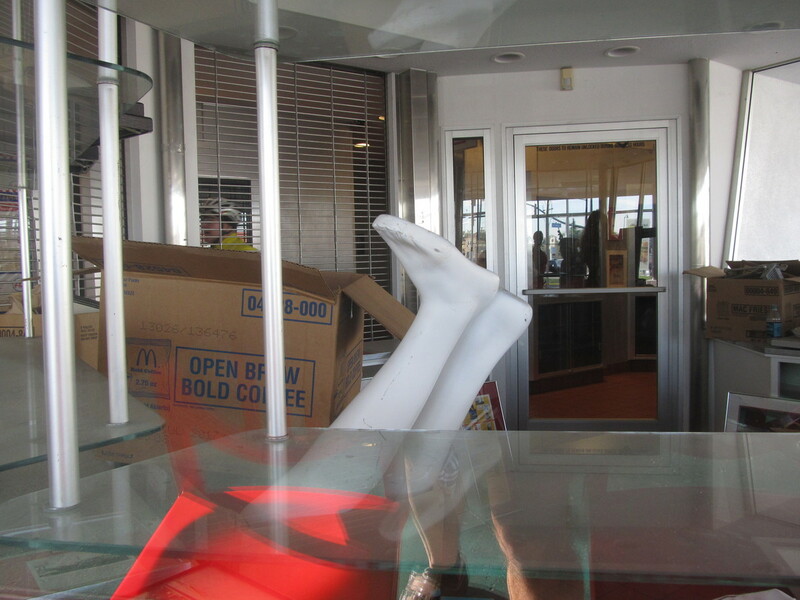 There were probably seven or eight people working there. 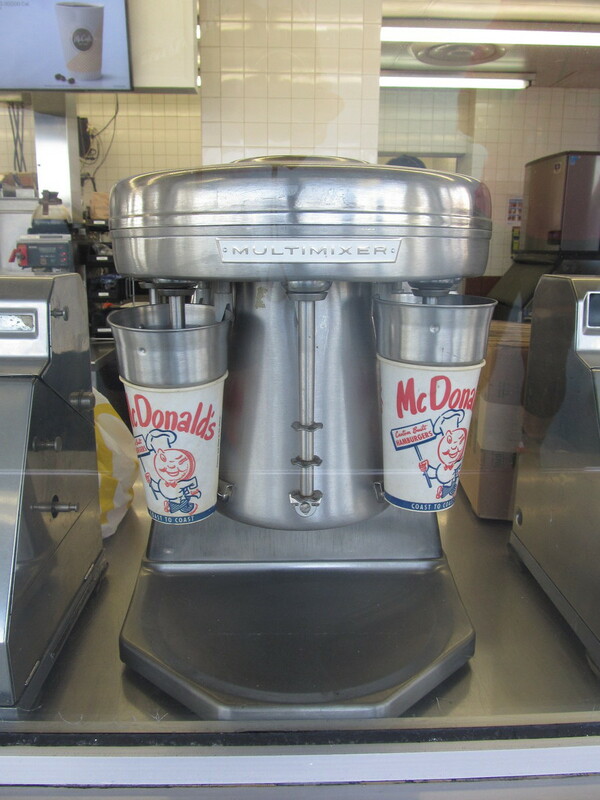 I talked to one, and she showed me around the counter, explaining what different things they had available. It seemed like a very well-run operation. The guards outside told us that they had only opened last Tuesday, and that they had had lines out the door since then. We managed to not wait in line just because we happened along just when they first opened. Leaving the pot shop, we headed back across Vernon. 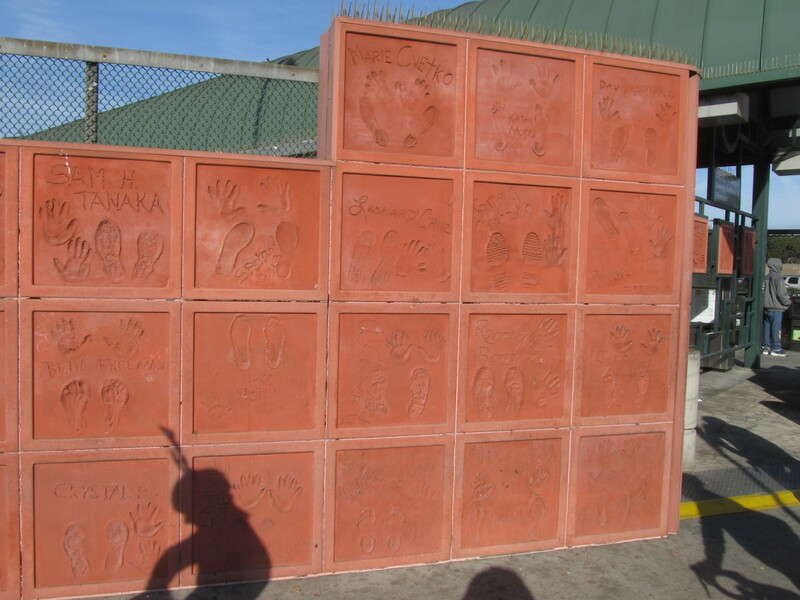 We saw the Southland Box Company. I thought there ought to be a whole herd of cats hanging around outside there. We also passed by the six or so houses there. Vernon is famous for being an industrial city with a ridiculously small population of only 113 people. 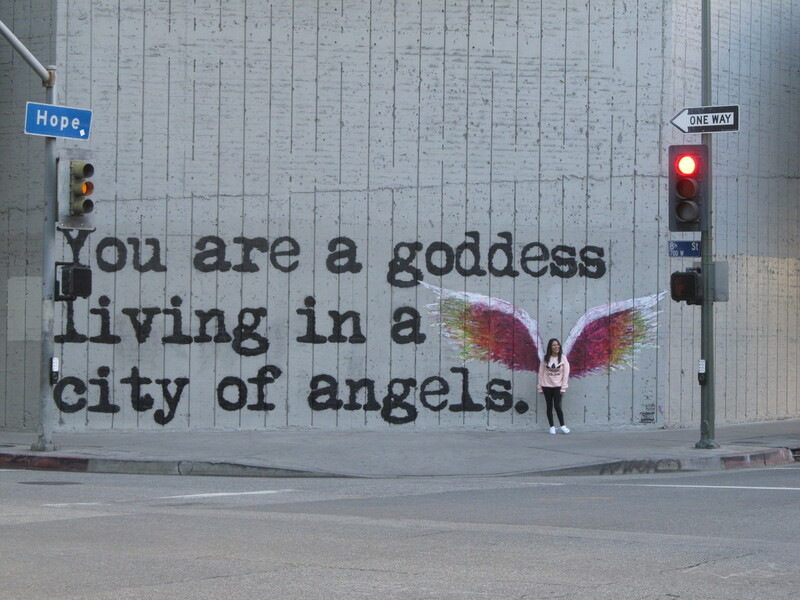 We rode back into downtown Los Angeles, and then out on 7th St to Bonnie Brae St, which brought us up to Echo Park. Out snack stop was at Chango Coffee there. I got a little artisanal breakfast sandwich there. 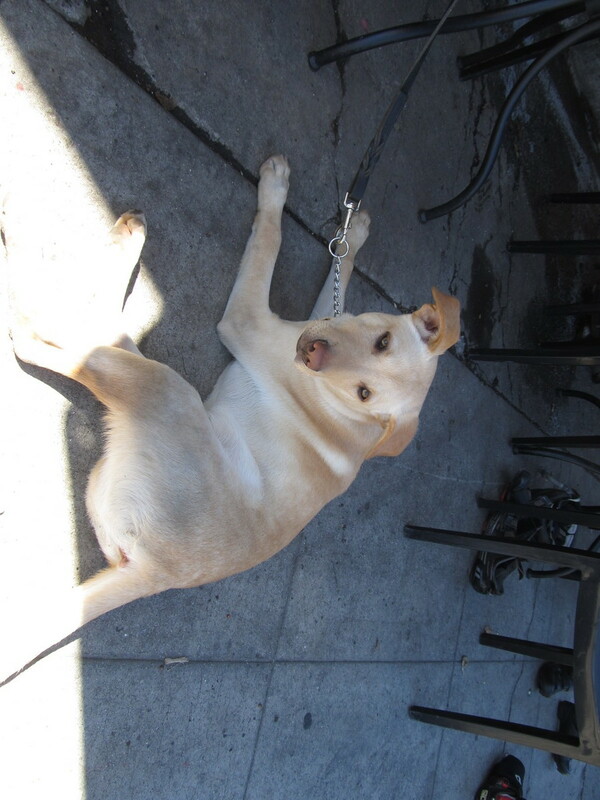 And of course, there were several absurdly well-behaved dogs there. At this point, my GPS hiccuped, and for some reason, it took no data on the trip from the coffee shop to Riverside Dr. Then it started up again, and recorded the rest of the ride. The route home took us through Highland Park, and then South Pasadena. It had turned into a very nice day, and it was a nice ride. 46 miles. Would have been maybe one mile more if the GPS hadn’t gone south. 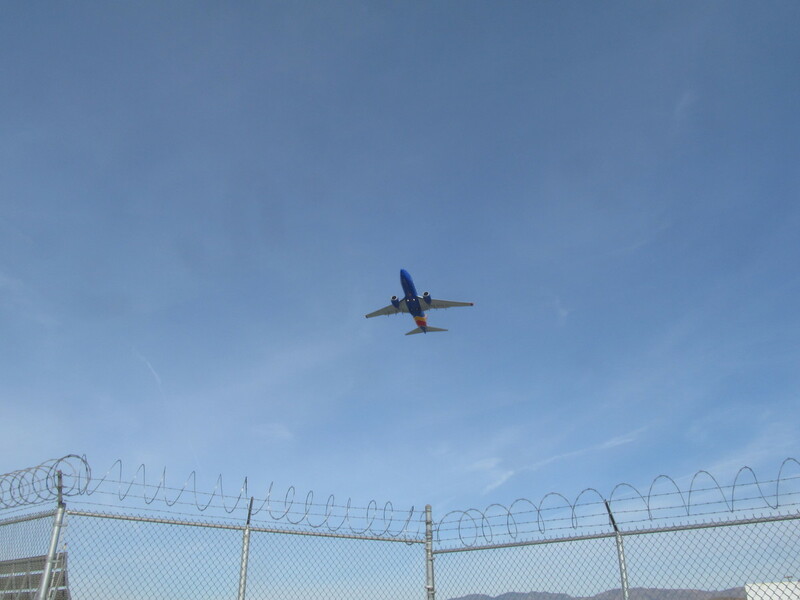 This week’s ride was the airplane-theme route to Burbank to see the F-104 on a stick in the park, and then to the airplane topiary at the entrance to Burbank Airport. 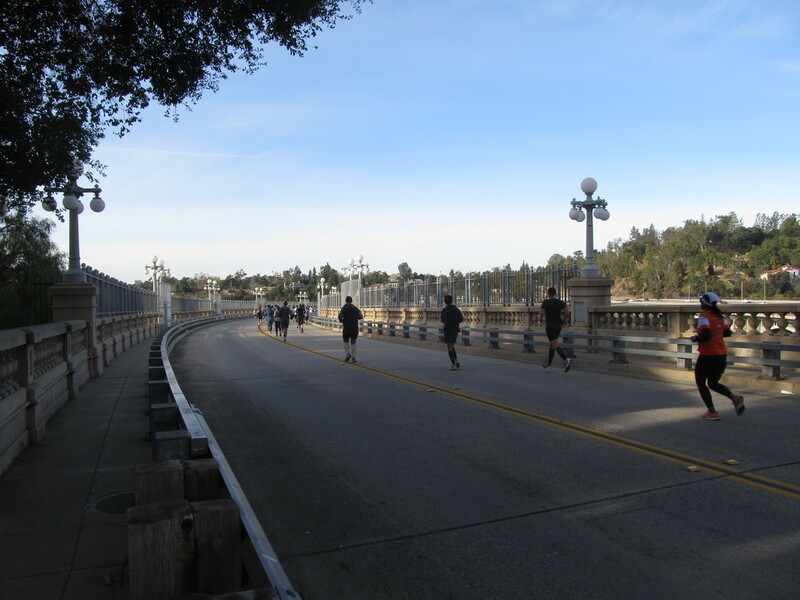 At the beginning, we had to take a little detour, since the Pasadena Half Marathon was today, and the Colorado Bridge was part of the course. The detour ended up taking us through the San Rafael Hills, and we were reminded of why we don’t usually go that way. Then we headed across Eagle Rock and Glendale to Burbank. 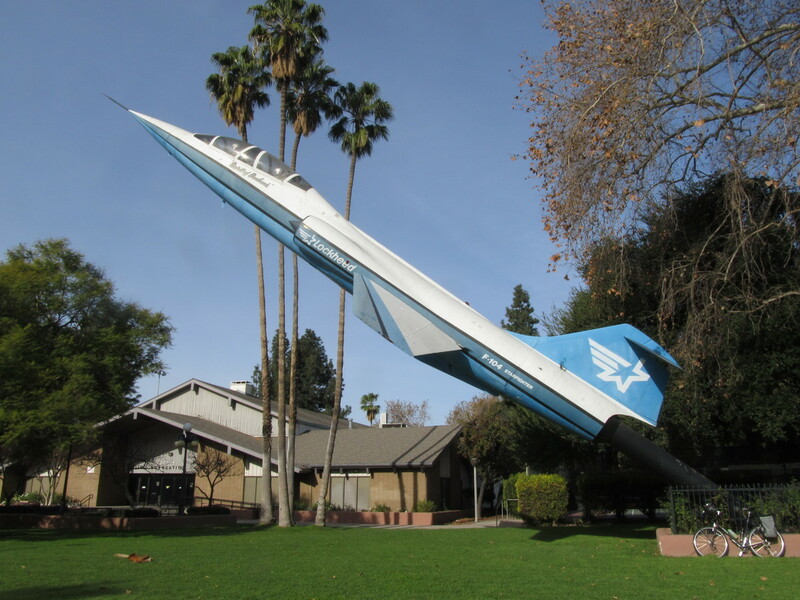 When we got to Olive Ave, we turned off to the park where the F-104 is on display. 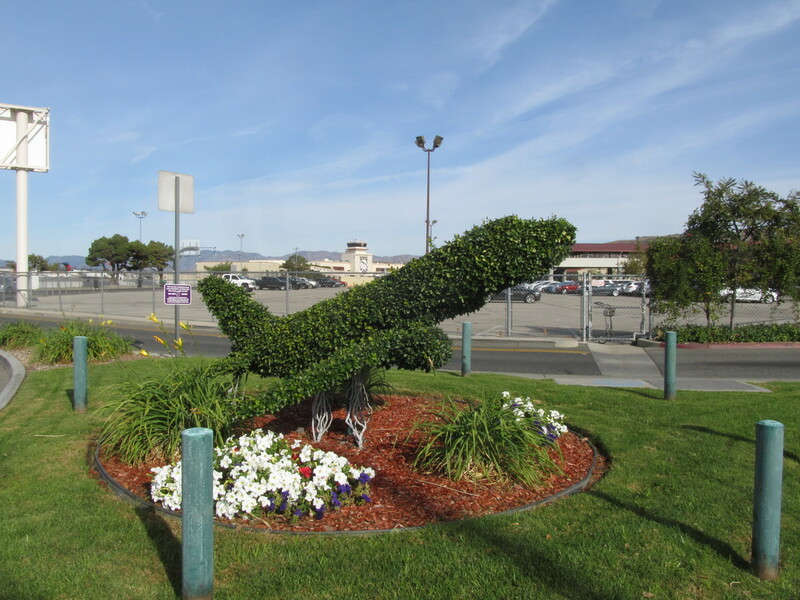 The topiary at Burbank Airport has filled out nicely. 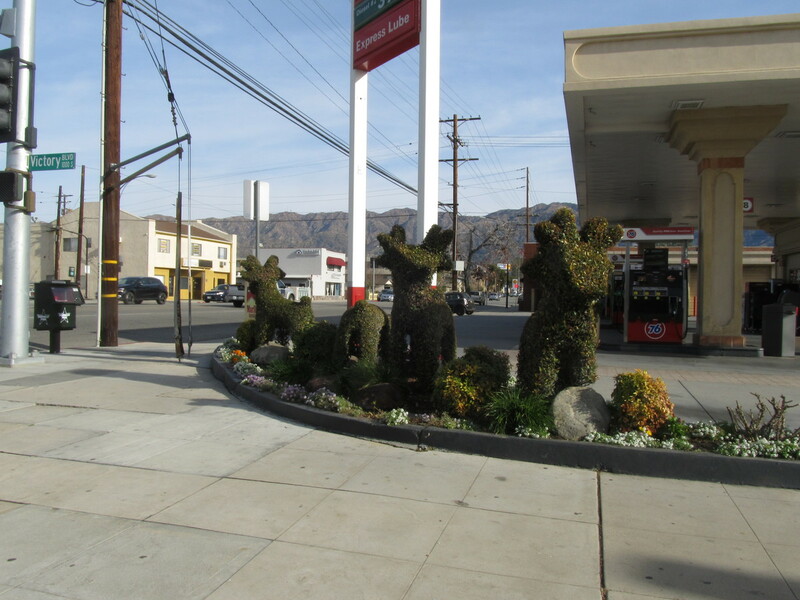 The bush inside it had died in 2013, and they replaced it with a new bush in 2014. 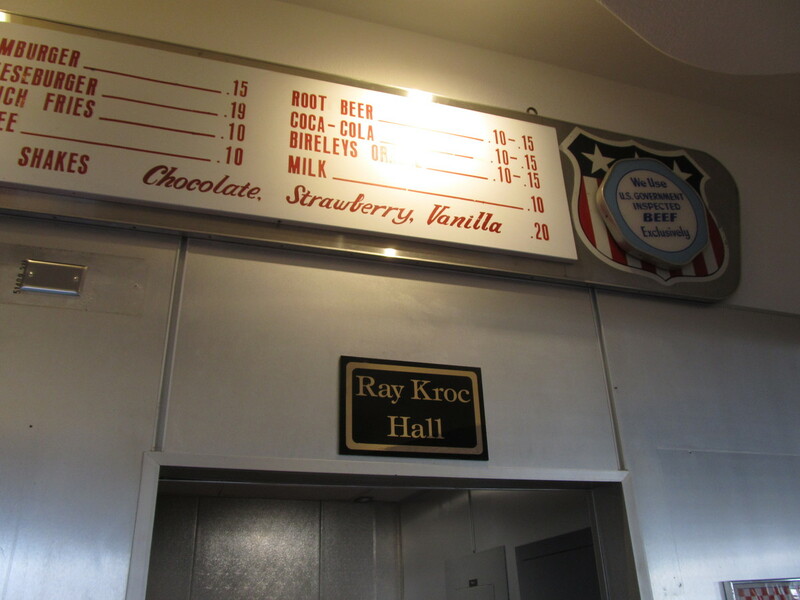 After that, we headed south to our snack stop at Priscilla’s. The route back send down the L.A. River, and then up the Arroyo Seco bike path. When we got to South Pasadena, I bailed out. We were running late, due to the detour at the start, and I needed to get home a little early. So I ended up taking the train back from South Pasadena. Today’s bike club ride was yet another visit to a filming location. 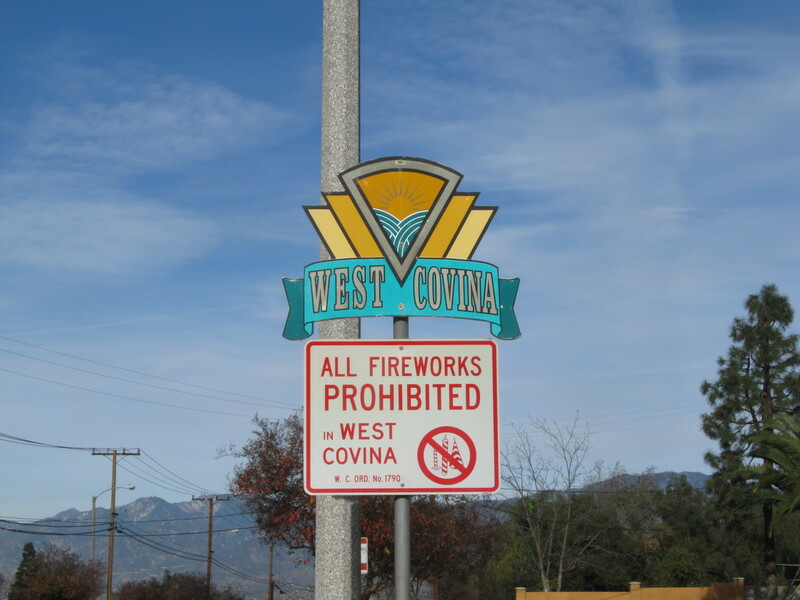 In this case, it was The Lakes at West Covina, which was the little plaza and fountain that was the setting for the climax of the big “West Covina” musical number from the first episode of “Crazy Ex-Girlfriend”. We took a kind-of roundabout route to get there, since the terrain out there is mostly flat. So this ended up being slightly on the long side for a regular Sunday ride. But that was all right. This past week, I read about how the first recreational marijuana shops are set to start opening here in California. In particular, they said that right now, there are just two shops licensed for this in the Los Angeles area. 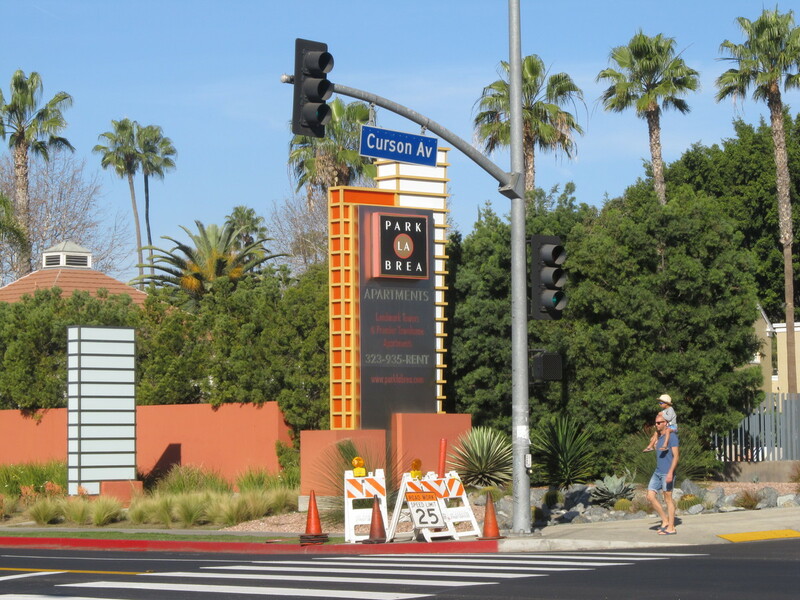 They are both in West Hollywood, so today’s bike ride was to go see one of them. We started out with our standard route to get to Hollywood. 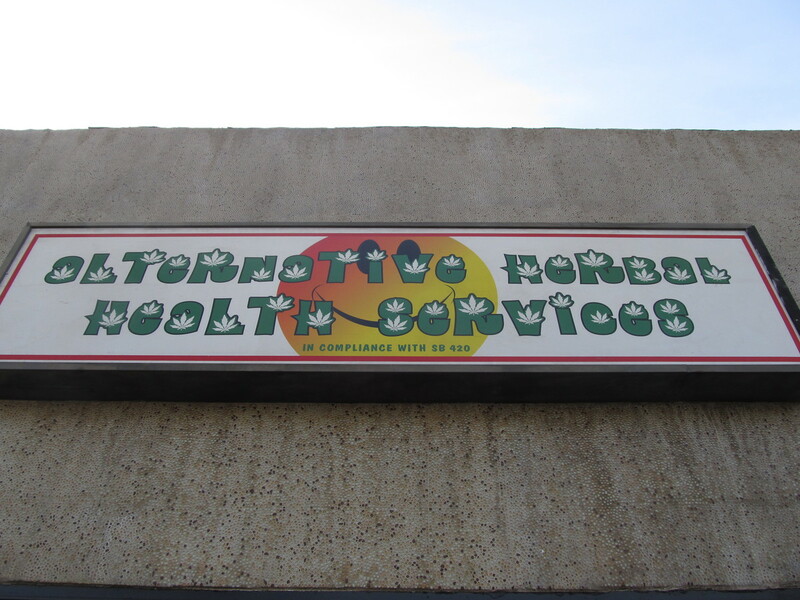 Then after riding across Hollywood, we crossed into WeHo, where we saw the Alternative Herbal Health Services store. It wasn’t open yet, and it looked to be locked up tight. I guess that’s to be expected, since it’s a cash-only business. 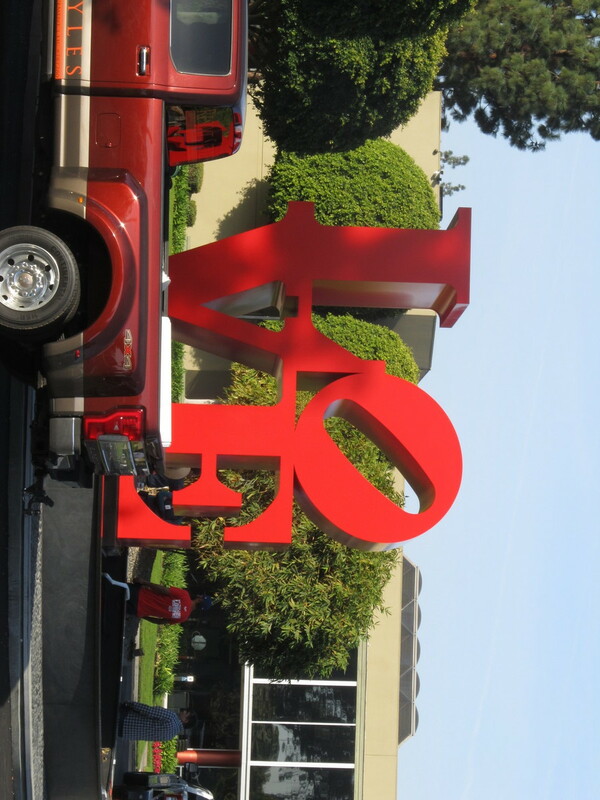 We went to Noah’s in Larchmont for some bagels and such, and then back home by way of downtown Los Angeles. Today’s bike club ride was a ride to Griffith Park, with the plan of making a loop and finishing the ride by riding down the length of the Rose Parade route in Pasadena. 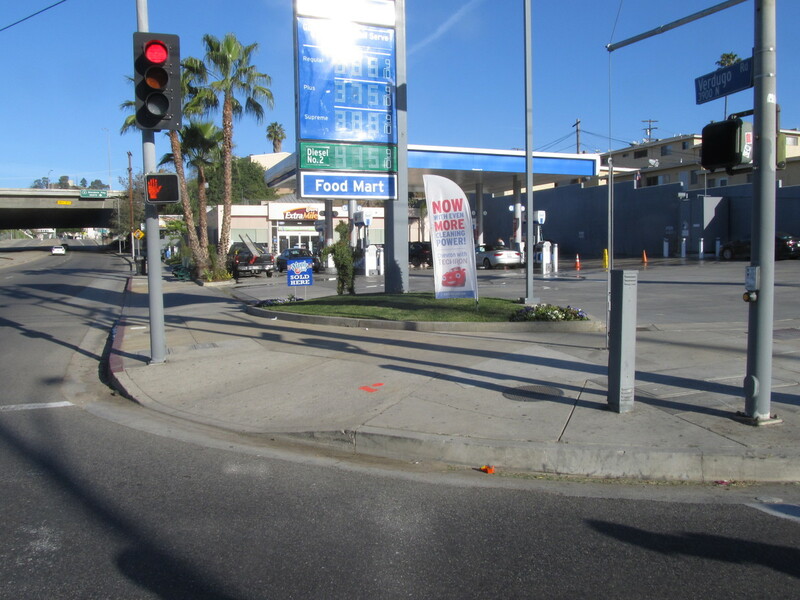 It’s New Year’s Eve, and people start camping out on Colorado Blvd early in the morning. We started out by heading up through La Cañada, so we started out with almost eight miles uphill, followed by another seven or so miles downhill. 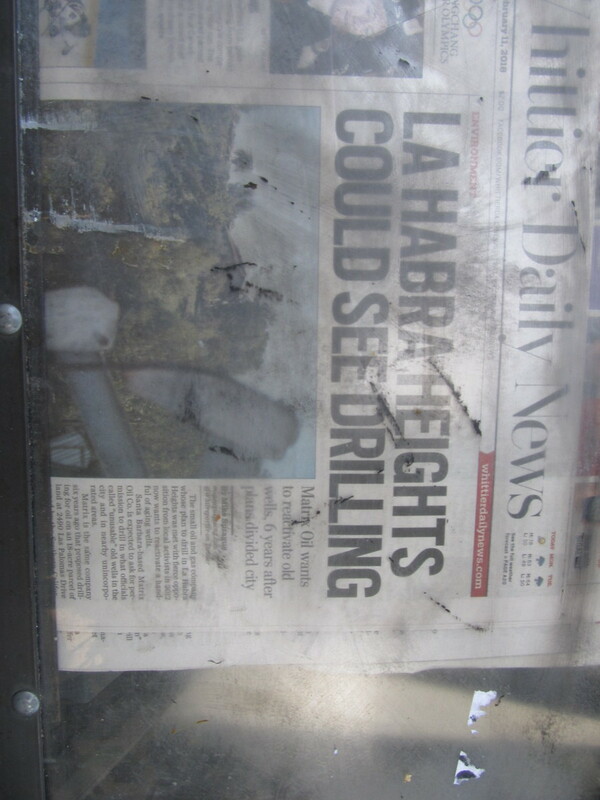 Then, when we got to Griffith Park, we rode up and over another hill there. Then we headed down the L.A. River bike path to our snack stop at Spoke. 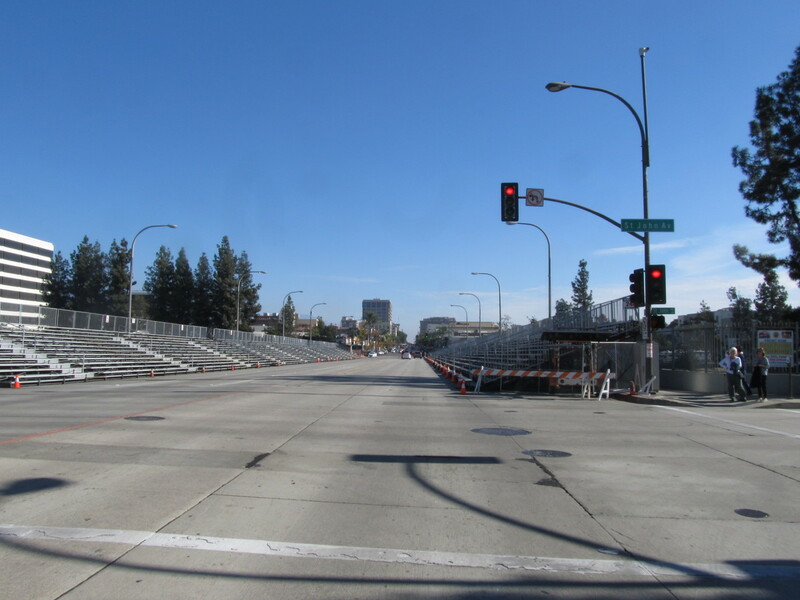 When we got back into Pasadena, we saw that the parade preparations were coming right along. There were people set up along the whole five+ miles of the parade route, even though the parade doesn’t start for something like 20 hours. 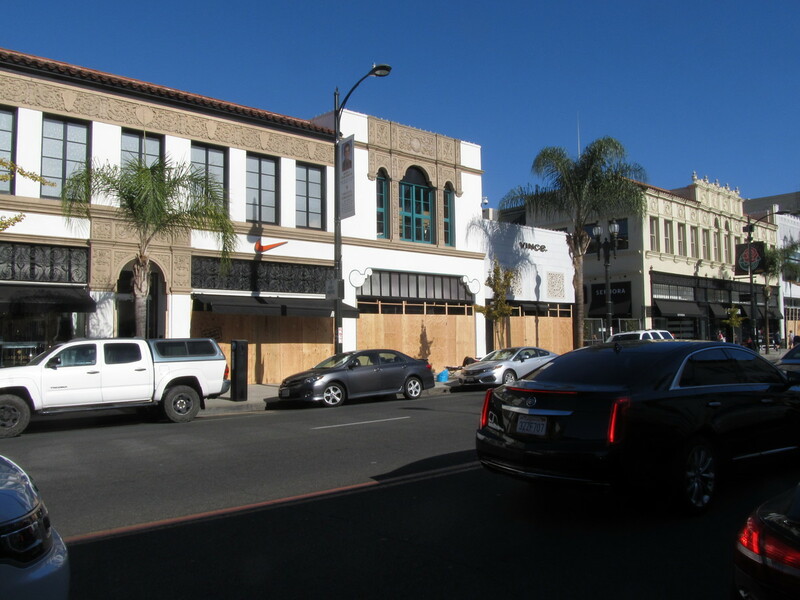 The way the stores are boarded up, it looks like a hurricane is coming. We rode all the way to the end of the route, which is right around the corner from the park where we start. Today’s ride was one we did a bit over a year ago, so it seemed like time to go again. And it’s a nice, flat route for the day before Christmas. We rode straight south all the way to Downey. 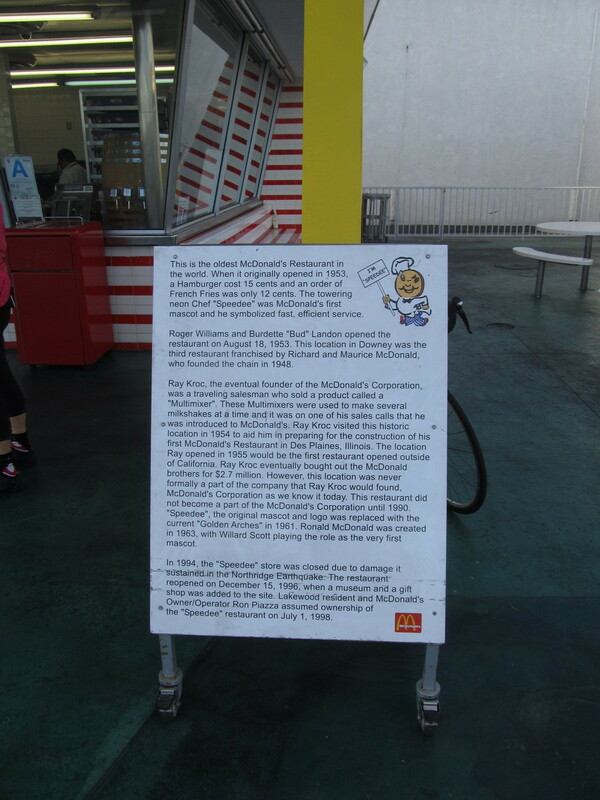 We stopped there for a few minutes at the oldest operating McDonald’s, and then continued on to the Wall of (Un)-Fame at the Metro Green Line station at the 105 freeway. 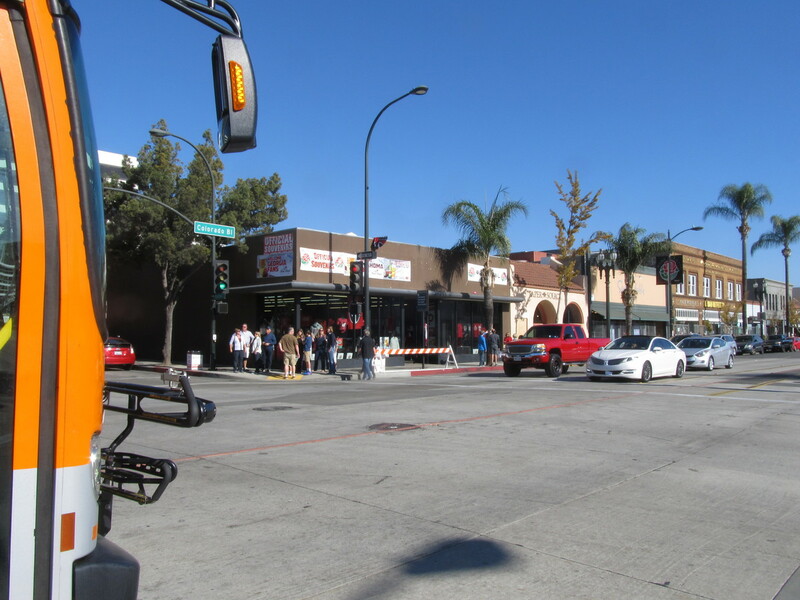 Then we headed back north into Downey to 3rd Street Coffee. 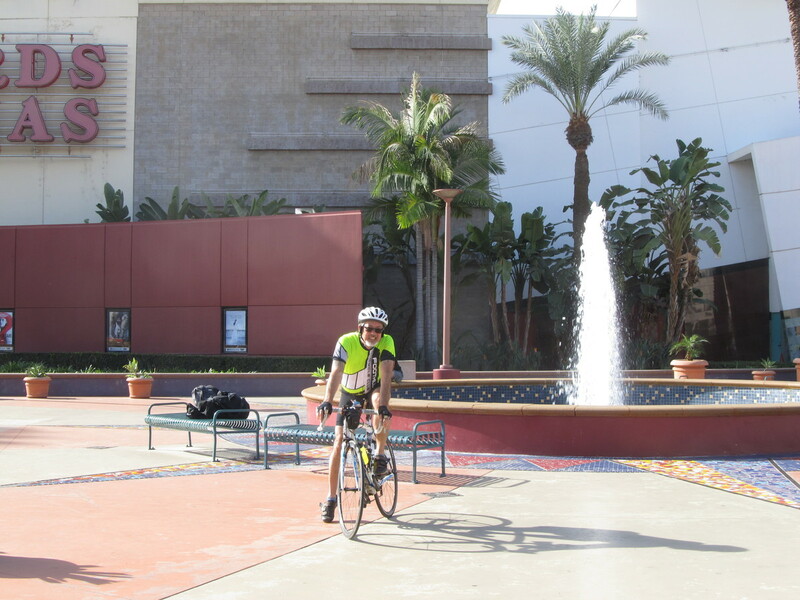 After some snacks and drinks, it was back up the Rio Hondo bike trail and home by way of Arcadia.